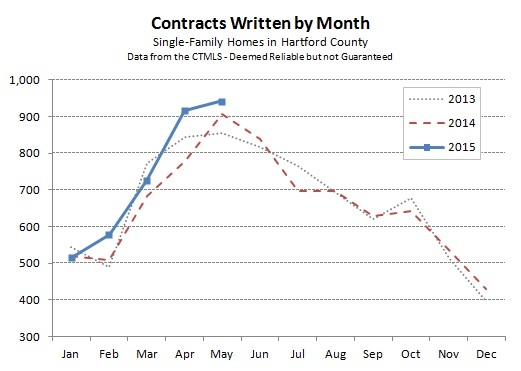 Hartford County had 994 single-family deals come together during the month of June. The total represented an 18% increase over June 2014, and a 5% increase over May of 2015. 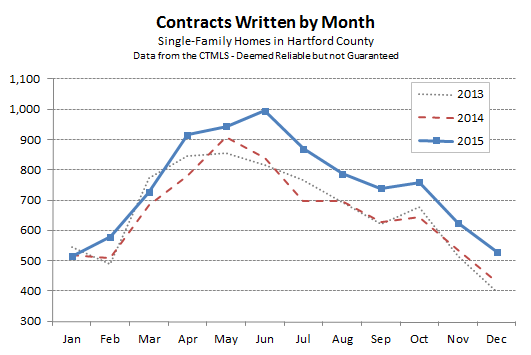 Last month we titled our May Contracts post “Peak Spring,” which was proven dramatically incorrect. 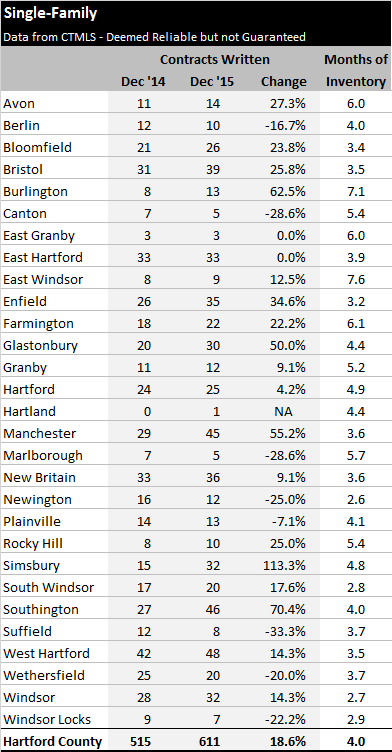 Numerous towns throughout the county outperformed in June, while very few towns showed meaningful drops in activity compared to June of last year. On a year-to-date basis, most of the increase in activity was in the $100,000s and the $200,000s. 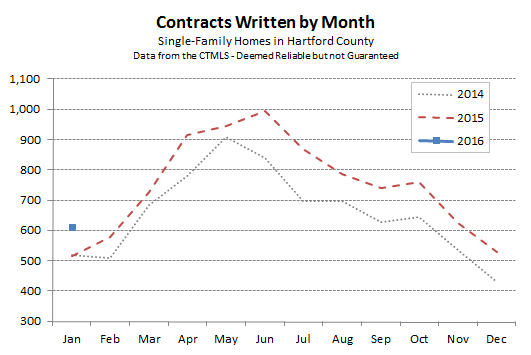 Those two price bands represented 63% of the total contracts so far this year, meaning what those are the buyers and sellers that drive the overall market. The number of distressed sales remained in line with previous analysis. 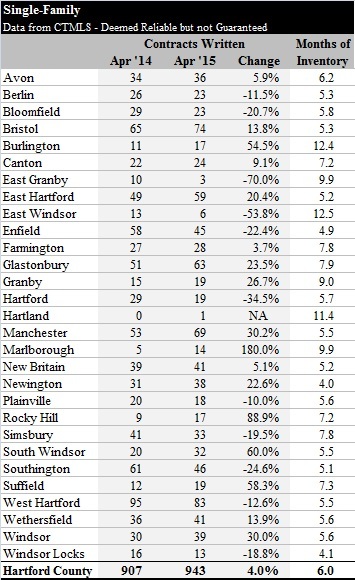 So far in 2015 about 15% of the contracts have been for properties advertised in the CTMLS as either bank-owned or as short sales. Inventory levels continued to vary by price band. 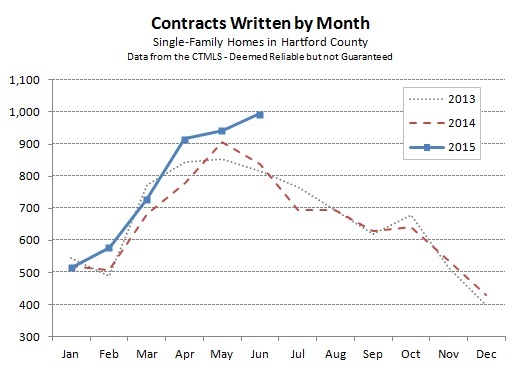 The overall level of about 6 months is pretty accurate for homes that have asking prices in the $200,000s. 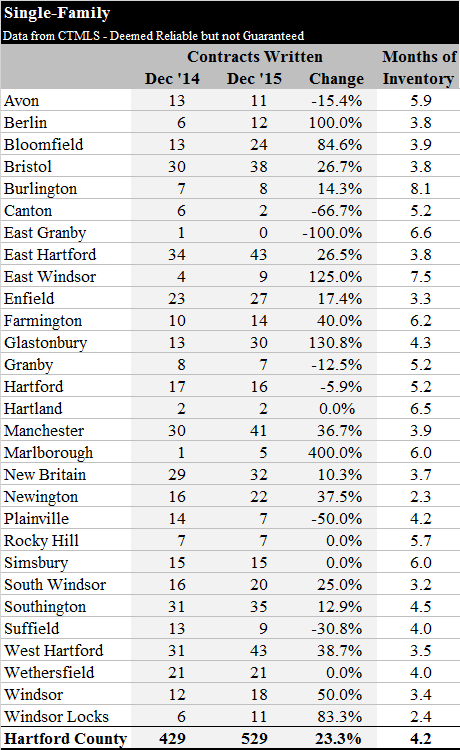 There are fewer listings available at the lower price bands (more favorable to sellers), and more listings available at the higher price bands (more favorable to buyers). Despite the pace of the overall market, it is still very much a buyer’s market for homes with asking prices above $700,000. This post and beam Cape offers dramatic soaring ceilings and a flexible, open floor plan. 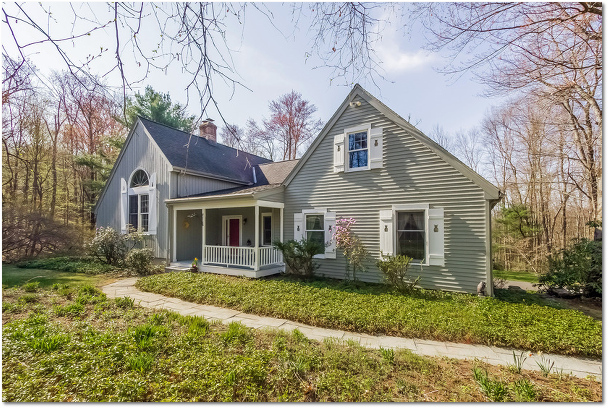 Tucked away on 1.6 acres, the house is a private retreat, yet close to Canton’s amenities. The living room and dining room spaces, with double sided brick fireplace, connect to the updated kitchen with granite counters and stainless steel appliances. The kitchen and an adjacent sitting room walk out to the tiered deck, overlooking the secluded backyard. The master bedroom suite features a spa bathroom with finished loft space and an office. Two additional bedrooms and a full bathroom complete the main floor. The lower level has the laundry room, unfinished space which could easily be finished, a walkout to the yard and an oversized 2×2 tandem garage which provides an extraordinary amount of storage space or work shop area. 29 Morgan Road is offered at $360,000. If you’d like to see this property, please have your agent arrange a showing or call me at 860-655-2125 to schedule a visit. More details and a photo tour are available.